As pioneers in the field, PortaFab has established itself as the industry leader by developing the largest line of high-quality modular building systems backed by an experienced team and nationwide network of certified dealers. When changes in your business create new demands for inplant space utilization, PortaFab’s modular office and building products provide you with unlimited flexibility to respond quickly and cost-effectively to your needs. The core of any modular building is its framing system and the OmniFlex leads the industry. Whether you need a simple supervisor’s office or a two-story inplant building, OmniFlex modular wall systems offer a high quality, low-cost solution. This versatile steel stud framing system utilizes 3′ thick walls that support load-bearing roofs and two-story construction without the need for costly support columns. It is our most popular and best value 3″ framing system. With OmniFlex walls, whenever you change your plant layout, your modular building can change with it. Non-progressive construction makes it easy to expand, modify, or relocate these units. So, you save time and money in the future, as well as on your initial modular building investment. With stud sections that physically connect back-to-back, OmniFlex provides the strongest load-bearing system on the market. The unique double layer steel studs provide more strength and the roll formed ends reduce tear risks during assembly. Color coordinated panels, studs, doors, and trim, bring a professional “front office” finish to OmniFlex in-plant buildings. Standard colors are champagne, gray and white with matching trim and wall panels for a smooth monochromatic finish. Optional colors can be ordered. 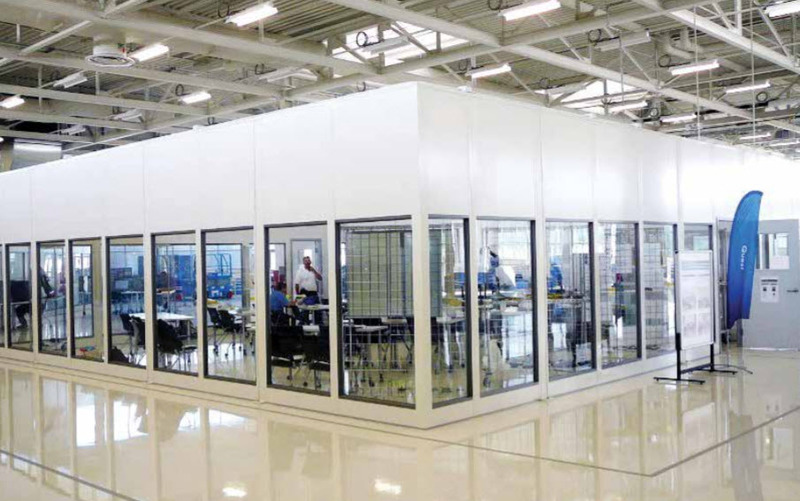 OmniFlex modular buildings offer quality, appearance, and cost savings that make conventional construction obsolete. They are completely reusable so your modular building can grow with your business. You save time and money in the future, as well as on your initial investment.